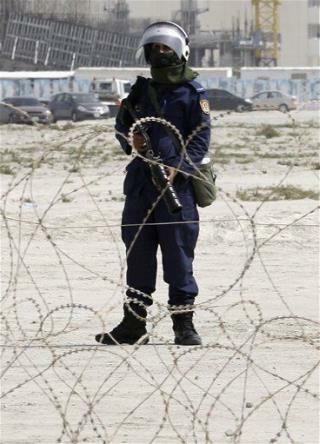 In Bahrain, the death toll after a surprise police attack on protesters rose to five. In Yemen, protests—and fights between those for and against the government—reached their seventh consecutive day, with police firing automatic rifles into the air in an effort to keep the opposing sides apart. Yesterday, government supporters used electroshock batons against those protesting the president and one person was killed. In Libya, protesters organized a "Day of Rage" today to challenge the 41-year rule of Moammar Gadhafi. At least four people were killed in clashes with security forces yesterday; one human rights group claims as many as 13 were killed by snipers and dozens wounded. In Iran, students attempted to hold a memorial service for an art student killed in Monday's protests yesterday, but authorities thwarted them and held an official funeral for Saane Zhaleh, calling him a vigilante. Even Iraq saw protests yesterday, these over unemployment, unreliable electricity, and corruption in the government. Three were killed and protesters burned the governor's headquarters and house in the most violent protest since unrest began in Iraq last month. The Egyptian military issued an initial estimate of the death toll during its 18 days of unrest: at least 365 civilians dead, plus prisoners and police officers. All of this is putting the US in an awkward spot, experts say. “For decades, the US sort of prioritized stability over democracy because of oil and Israel,” says one, but “the current policy is not sustainable." I am sure that BO and his cronies will try and take credit for the democracy that is spreading across the middle east. It was George Bush who it laid the foundation for democracy in the middle east, democracy is infectious and once you get a taste of it you want more. Bush over through Saddam and gave the people a taste of democracy and now they want more! We did the same in Japan and South Korea. China and North Korea are the next regimes to fall. Kudos to GWB for understanding that by laying the foundations for democracy in one middle-eastern nation other nations would follow. Ah, when the chickens come home to roost they lay a lot of eggs and there's no peace in the hen house. But in the words of the poet Carl Sandburg his poem, "The People, Yes", pretty much says it all. Google the title and read the prophetic words of a great poet and thinker. Just offerin' . . .